I've really enjoyed pairing the deep, smoky flavor of Teet's sausage with rich flavors and creamy textures. Let's just say that it has a great outcome. I could describe how delicious these dishes have been, but the telling evidence is always a clean plate. Take my word for it: these plates were scraped completely clean. It's easy to whip up an Alfredo-inspired sauce. Some cream simmers with Cajun seasoning for just a minute, and you're halfway there. 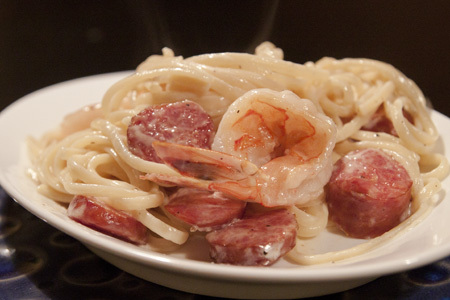 You could leave out the shrimp and enjoy this dish with sausage alone, but I love the combination. Yes, it's a luxurious dish - but sometimes you've got to indulge. Bring a large pot of water to a boil. When it boils, add the fettuccine and cook until almost done, about eight minutes. Drain but do not rinse. Meanwhile, in another medium saucepan, heat the cream with Slap Ya Mama seasoning until it comes to a simmer. Lower the heat. Add pieces of butter one at a time, whisking after each addition until fully melted and incorporated into the sauce. Turn the heat off completely. By this time, the pasta should be cooked. Add it to the pot and mix well. Add most of the shredded cheese, leaving some for garnish. Stir it well to melt everything. Then add the reserved sausage and shrimp. Stir until everything is mixed well and heated through.